A couple weeks ago we asked our readers on Facebook: What is your preferred condiment with fries from Zip’s? We couldn’t say so at the time, but it was an informal survey for our Best Of readers poll issue. Zip’s won the most votes for Best Fries, but many people feel at least as strongly about what goes with those fries. The “other” category includes mustard, mayonnaise, malt vinegar and a few other obscure dressings or blends. Those in the Fry/Tartar category expressed an affinity for both, saying they alternate between the two or choose based on which Zip’s they’re visiting. The Zip’s on Market Street got the most specific mentions, with some people saying they won’t get tartar anywhere else. In the milkshake category, chocolate was more popular than vanilla. These results omit a handful of comments from people who just don’t like fries or fast food in general and felt the need to say so. Which is fair enough, but anti-fry responses are left out to avoid skewing the percentages. 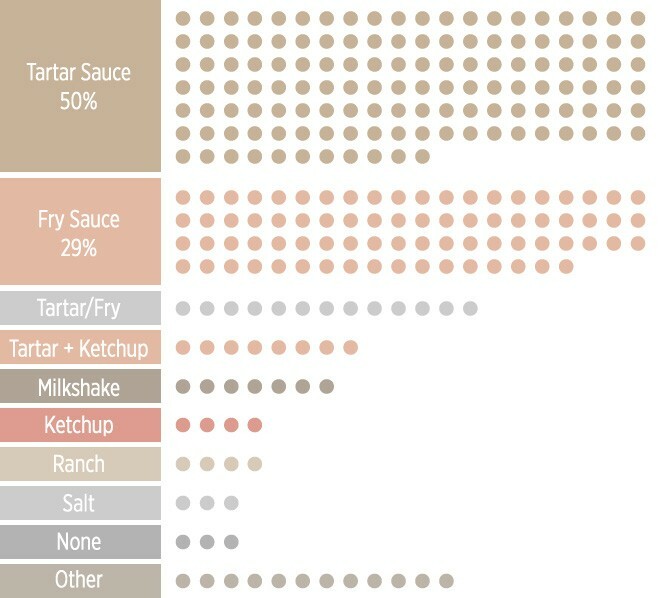 However, those who reported a favorite condiment but said they prefer tater tots are included, because that’s still within the spirit of this thing.